There are a lot of useless products out there marketed towards babies and new parents. Amidst the chaos of gadgets & gizmos promising you to watch your children for you, turn your child into a mini software engineer, train your children to sleep like adults, and to otherwise make parenting a virtual Walk in the Park… there is something already out there that can do most of those things. It is a modern day version of one of the most traditional forms of child rearing known to countless cultures across time and space. If you have a baby in your life, it’s very likely that you have seen some baby carriers in your days. If you are extremely unlucky, you have a wife/partner/co-parent that is obsessed with these things, and owns more than you own pairs of shoes. Well, the truth of the matter is that these carriers can be one of the greatest parenting tools you could ever have. Getting your hands on a *comfortable* carrier can be a life altering moment in your relationship with your child. You have the opportunity to be a happier, more confident parent, and to be exponentially more helpful to the other parent of your child. I will break it down into 4 basic reasons that Babywearing is such a benefit to your family, and for you specifically as the non-birth parent. I put this as #1, because that seems to be the biggest preoccupation with new parents, overall. No matter what approach to a parenting philosophy you decide to follow… we can all pretty much agree that stopping your infant from crying is a large part of your motivation behind it. A (1986) study by Hunziker and Barr, two Montreal Pediatricians, looked at a control group of 99 infants. They asked the parents of these infants to wear their babies in a sling (provided to them) for at least 3 hours a day. At the end of the study, they found that the babies who were worn regularly cried 43% less. Even more exciting, they cried 54% less during the evening hours. Bonus. Countless caregivers have experienced this phenomenon. It can be especially helpful for an infant with colic, or one with Reflux, as it helps them to remain upright – the most comfortable position for babies with this condition. It has even been suggested that historically, in societies where caregivers had to hunt for their food – babies were worn to prevent them from crying, which would scare away the prey and draw the attention of predators in the area. It even makes sense from an anthropological standpoint! When you wear your infant at the same level as other adults, you are constantly exposing them to conversation, dialog, facial expressions, gestures, and the tone of different expressed emotions. As a result of this, it has been found that babies that are worn, often talk much earlier than counterparts that are constantly being placed away from their caregivers. Worn babies can be more emotionally intelligent as well, because babies learn many things by mirroring their caretakers – which they have more of an opportunity to do if they are being able to observe everyday interpersonal interactions. Babies have been found to absorb new information and skills much better in certain mental states. Attachment Parenting gurus William and Martha Sears had the following to say about babies that are worn by caregivers: “Sling babies spend more time in the state of quiet alertness . This is the behavioral state in which an infant is most content and best able to interact with his environment. It may be called the optimal state of learning for a baby.” We go to great lengths to teach things to our babies using outside stimuli – but the simple act of wearing them at our level, can teach them so much, with so little effort. Developmentally, human babies are born incredibly immature. Whereas many other mammals give birth to babies that can walk, run, and soon feed themselves… human babies spend pretty much the first year of their life unable to walk or self-feed. Particularly perilous for babies, is what they refer to as the “Fourth Trimester”, the first 3 months of the life of an infant. Baby is meant to be constantly in the arms of their mother, using her heartbeat and her breathing almost as a metronome for their bodily functions. All of the central operating systems of the baby, their respiratory system, circulatory system, digestive system, eliminative systems, nervous system… they become easily disordered causing undue stress to a newborn. A small baby is quick to get overwhelmed and exhausted. Being held skin-to-skin against the parents’ chest, is the best way to help them to remain calm and regulated. Hospitals have been integrating this practice into their care routine for infants born preterm. It is referred to as Kangaroo Care, and has been found to be incredibly helpful in the survival and recovery rates of premature infants. (If you want to know more about this “Fourth Trimester” and human gestation, I recommend checking out the discussion on Exterior Gestation in Touching, The Human Significance of the Skin by Dr. Ashley Montagu. Great read!) 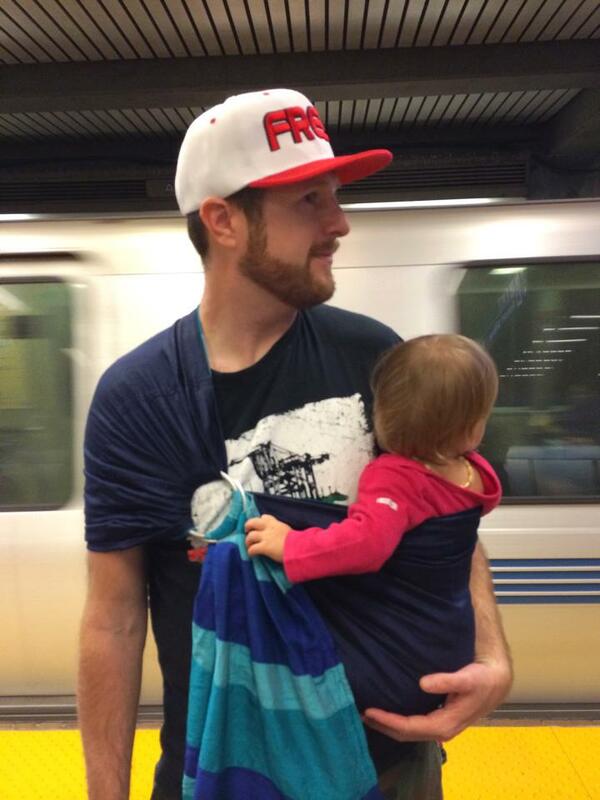 Wearing your baby in a soft carrier close to your body (even without a shirt on!) is helpful in bonding with and regulating your newborn baby, soothing your infant to sleep, calming your fussy teething toddler, even helping your preschooler to decompress. Sometimes I hear Babywearing scorned by people concerned that worn babies “will never walk” since they are used to being carried. That couldn’t be farther from the truth! Contrary to what people may think, worn babies often walk sooner as a result of more developed core strength. The carrier is designed to aid them in maintaining an ergonomic, upright position until they can attain it on their own, but in the meantime… this is a tremendous way to engage those core muscle groups – which will later be very important in standing and walking upright. I call this one the “Your wife/partner will think you are super-hot and want to make many more babies with you” benefit to Babywearing. Seriously. Maybe I should have put this one first. Having a new baby is hard. It is especially hard on the mother. She has all these insane hormones shifting around inside of her, a wrinkly & helpless little human constantly relying on her for their every meal and breath (practically)… and there is very little that a dad/partner can do to help alleviate that feeling of being solely responsible for this life. But Babywearing helps. It helps the mother feel that she can trust that you will keep the baby close to you, and safe. It helps her to know her baby won’t be left to cry somewhere if she tries to take a shower or a nap. It helps your baby to become familiar with your smell and your sound and your heartbeat… so they will feel safe with you in their mother’s absence and are less likely to cry. It will help you to be a more confident parent, because you have one of the most tried and true tools in your parenting arsenal. All that, and you get to be hands free too. Many parents express frustration that their baby “won’t stop crying” when they aren’t being held. Whenever I hear that nowadays… I always assure them that they have a Smart Baby. Your baby is asking for exactly what they need, and you can provide it to them without having to give up such luxuries as eating a meal. 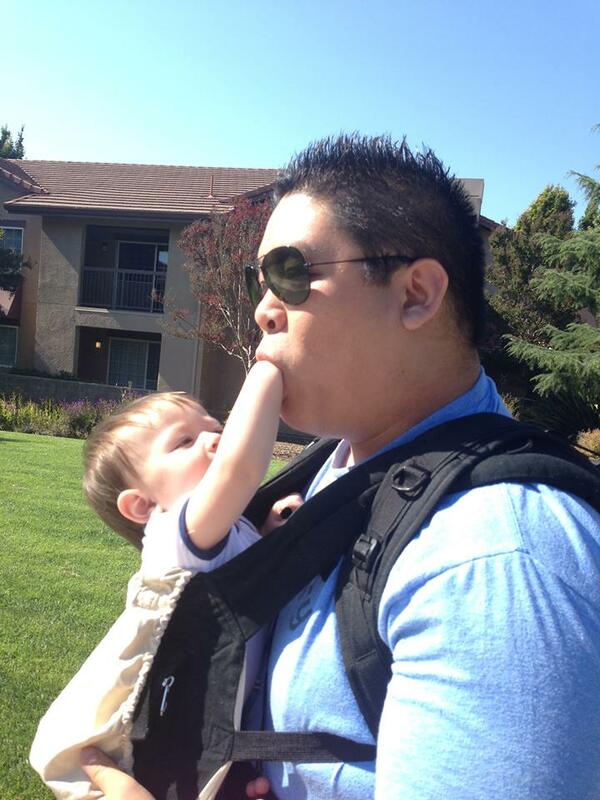 Safely wear your baby, and have your hands free for the rest of what life throws at you. 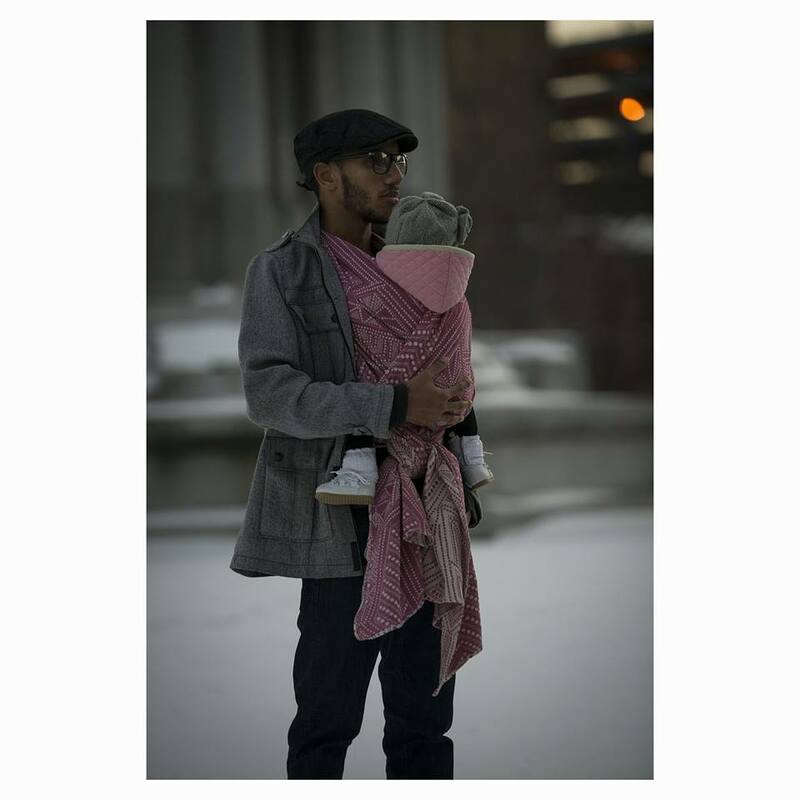 Take your baby for a walk outside in a carrier. Take them to watch your older kids play sports outside, take them to the store, take them to the mall, take them to a park. Wear them on your back while you clean dishes or take out the trash. What could possibly be hotter than your partner doing housework with your child strapped to them? To a new mom…. Not much. Trust me. So, you want to be one of the cool guys? 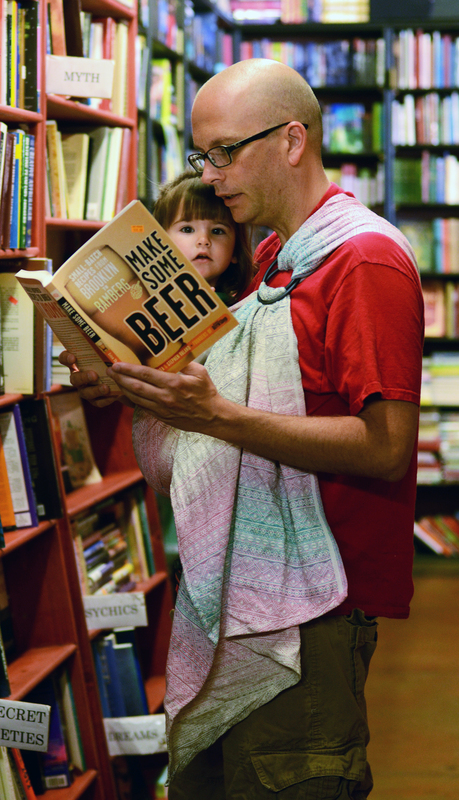 In the running for “Father of the Year?” Where do you begin? Well, everyone knows about those front-facing backpack style carriers (some older Bjorns, Snugli, Infantino, to name a few of them). These are the most common ones in stores, but are actually probably the silliest looking and most uncomfortable ones on the market. Will your baby still get all the benefits of being worn? Of course. Will your back hurt like hell and make you not want to wear the baby anymore? Most likely. I have read so many blog posts or seen comments on Babywearing forums about how people stopped wearing because their kid got too big and it hurt their back. I totally agree that kids get big and heavy, but most people would likely be able to wear for a lot longer if they had a more comfortable carrier suited to ergonomically carry a baby/toddler. There are many different kinds of carriers out there! 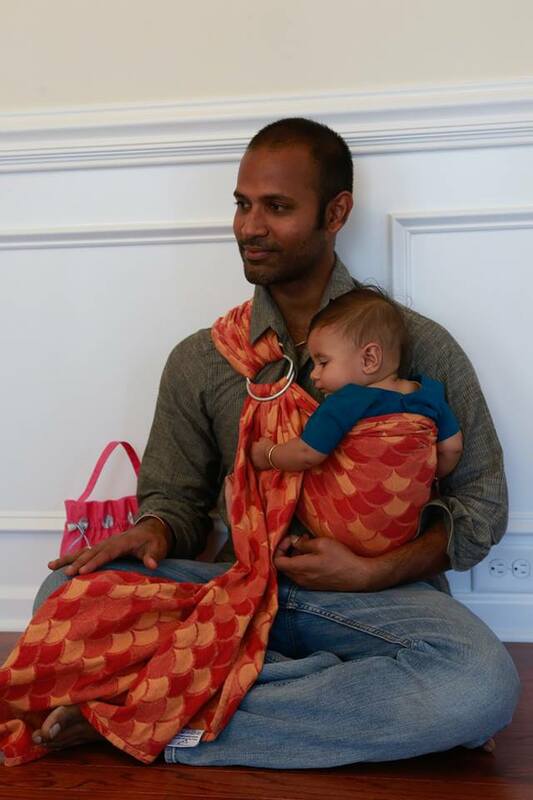 The most common ones you can find on the market, are Ring Slings, Meh Dai’s, Woven Wraps, and Soft Structured Carriers. You can buy these things online, and locally at many baby stores. There are actually organizations, like Babywearing International for example, that are out there to help you figure out what kind of carrier could work for you and have awesome Volunteer Babywearing Educators that are there to help you with using one. 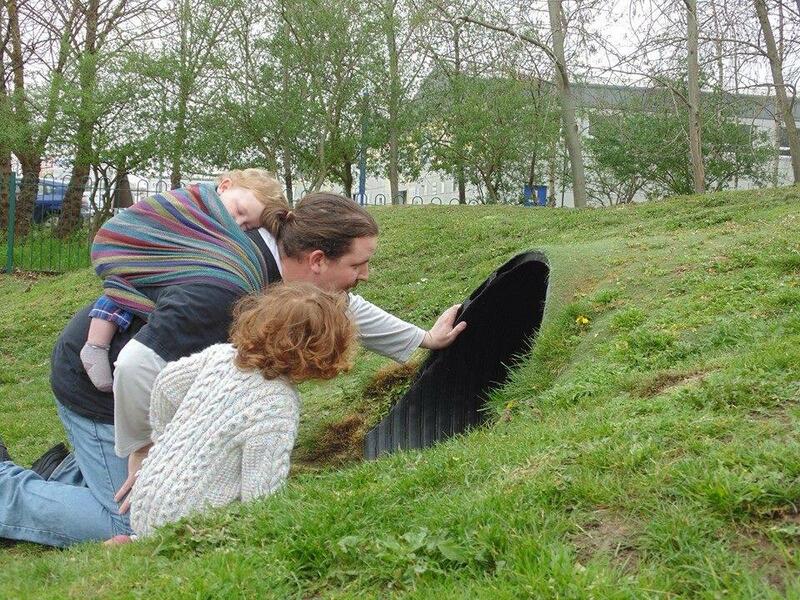 Some even have meetings with lending libraries where you can try on and borrow carriers. Amazing, right? There are some places online where you can get some more information also. I have to shout out to The Babywearer.com which is the ultimate resource on all things Babywearing. 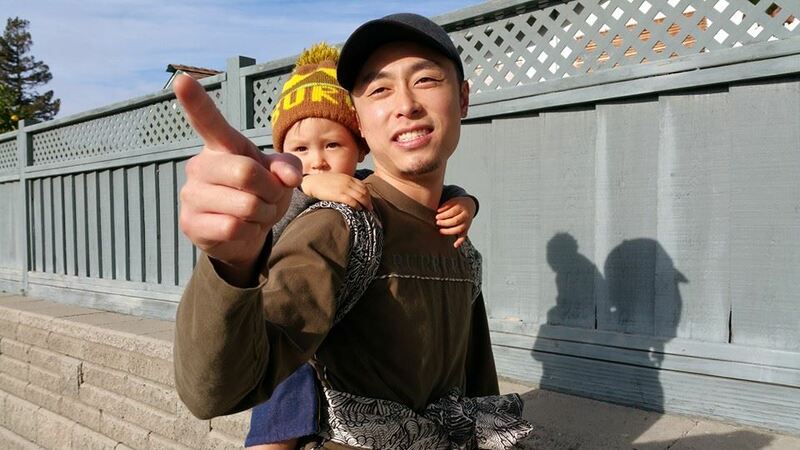 Sheffield Sling Library has some great articles, and BOBA actually has one of my favorite compilations of articles on the benefits of Babywearing. Flashy. 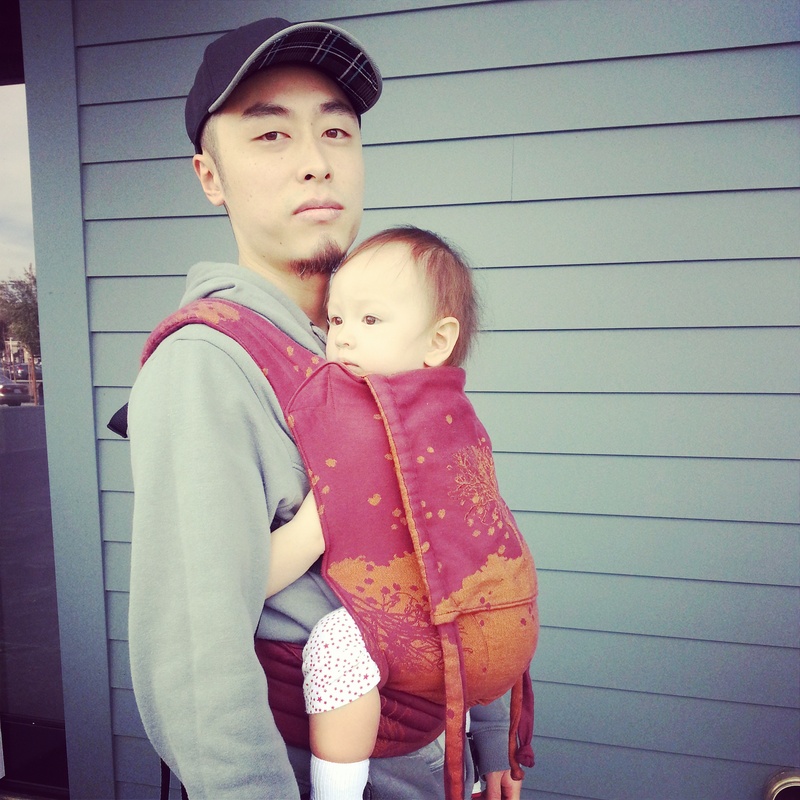 If you are a guy reading this and you are at all concerned with not looking *manly* enough in a baby carrier, I present to you some of my favorite Daddy Wrappers: Danny the Babywearing Dad and Slingdad Dom… holding it down on the Y side of the spectrum. These guys are out there spreading the message that Daddies can wear babies too. They both have some great You Tube Babywearing tutorials out there for your viewing pleasure. There, I made it all easy for you and everything. Click on those links! Ask for some help! Let your baby’s mama pick out a carrier! Wear.All.The.Babies! There are lot’s of us.